In this self-referential universe that is the interwebs, I am linking to a link that links back here. My profile as a blogger was featured on miss604.com last week. I had no idea I was part of the local blogger scene now, but apparently I am. Rebecca Bollwitt who runs this popular blog about what’s happening in Vancouver, found my blog and asked if she could interview me for hers. Of course, this little bit of attention is flattering. Above is a sketch from late last summer. 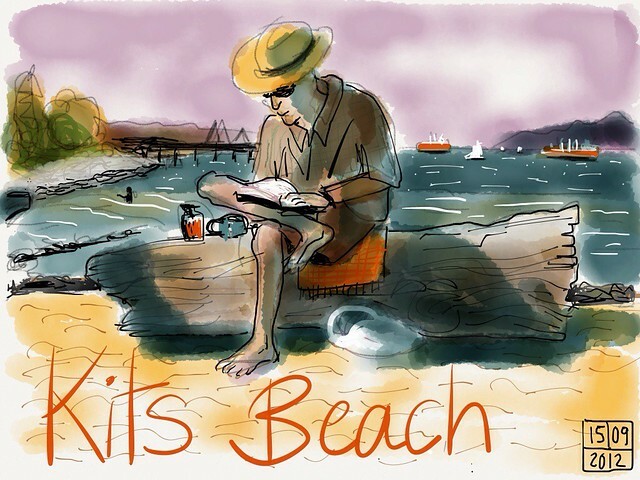 Drawn on location on my iPad with the Paper app. It was so bright at the beach that I couldn’t tell that the colour I was using for the sky was not blue, but mauve. When I realized the colour was off, I tried erasing it and replacing with blue, but I had to admit that the mauve was better, and reverted back to it. Next time, I’ll just get a monkey to make colour decisions for me, apparently I am not needed. I do not know this dude in the drawing, but he was nicely sitting still for me while reading a book.